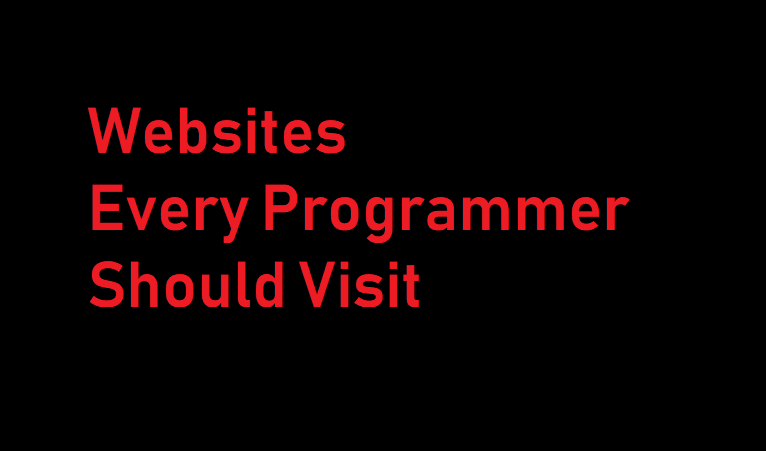 Today I provides a List of Some Websites Every Programmer Should Visit. There are many Great Websites out there! These are few of them! Visit websites given below. The world’s largest developer community. Stack Overflow is a privately held website, the flagship site of the Stack Exchange Network, created in 2008 by Jeff Atwood and Joel Spolsky. It features questions and answers on a wide range of topics in computer programming. Stack Overflow is the largest, most trusted online community for developers to learn, share their knowledge, and build their careers. More than 50 million professional and aspiring programmers visit Stack Overflow each month to help solve coding problems, develop new skills, and find job opportunities. Still Tech World’s Largest Repository of Open Source Projects. GitHub Inc. is a web-based hosting service for version control using Git. It is mostly used for computer code. It offers all of the distributed version control and source code management functionality of Git as well as adding its own features. GitHub is a development platform inspired by the way you work. From open source to business, you can host and review code, manage projects, and build software alongside 31 million developers. Reddit is an American social news aggregation, web content rating, and discussion website. Registered members submit content to the site such as links, text posts, and images, which are then voted up or down by other members. Reddit provides a constantly updating feed of breaking news, fun stories, pics, memes, and videos just for you. TechCrunch is an American online publisher of technology industry news founded in 2005 by Archimedes Ventures whose partners were Michael Arrington and Keith Teare. It reports on the business of tech, tech news, analysis of emerging trends in tech, and profiling of new tech businesses and products. Here You can explore Latest Tech news and Trends. for Web Designer and Developers! Smashing Magazine is a website and eBook publisher that offers editorial content and professional resources for web developers and web designers. Founded in September 2006 in Germany, Smashing Magazine delivers reliable, useful, but most importantly practical articles to web designers and developers. This is best Place, Here you can found articles with quality, Books, Events, Jobs. build the future. DZone.com is one of the world’s largest online communities and leading publisher of knowledge resources for software developers. Every day, hundreds of thousands of developers come to DZone.com to read about the latest technology trends and learn about new technologies, methodologies, and best practices through shared knowledge. Dzone is Very Useful for IoT and open sources. Hashnode is a friendly and inclusive community for software developers. Unlike other Q&A networks, we encourage subjective and opinion based questions and want developers to express themselves. The broader goal is to help software engineers develop new skills, stay relevant and connected.